We feature verified customer reviews for our cottages together with the feedback left on TripAdvisor. Flexible payment options for your peace of mind. Our friendly UK team are here to help, in case of any emergency. We take over 1 million customers and their pets on holiday every year. Over 25 years of experience in UK self-catering holidays. 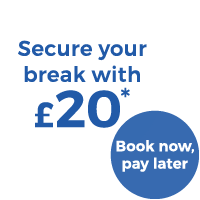 All it takes is a £20 deposit to secure a holiday to remember. Stop day-dreaming, start sykes-seeing! Secure a memorable getaway this May Half Term and choose from over 4,000 available properties. Recharge the batteries and secure yourself the short break you've been promising yourself. 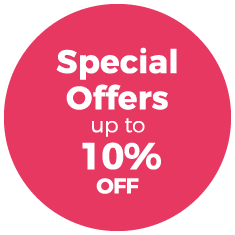 Keep an eye on our special offers page, which is regularly updated with new properties and deals. Over 293,000 property reviews from real guests! We had a lovely family Easter break. A beautiful cottage in an amazing location. The cottage far exceeded our expectations. The house was fantastic and the hosts friendly. We have stayed at Elm cottage in the past, and were happy to book here again as it is in a very convenient location and very comfortable to stay at. Need help finding your ideal cottage? Why book with Sykes Holiday Cottages? 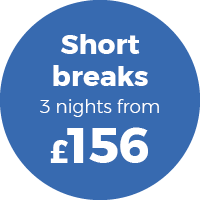 Great value: We think everyone deserves a break, so we work hard to ensure all of our cottage holidays are competitively priced. 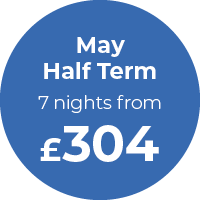 With a variety of discounted short breaks and special offers available, including last minute and off-season reductions, you can find a great deal on your next cottage holiday. Here to help: You can book your next cottage holiday online or by getting in touch with one of our helpful holiday advisors. Our dedicated team of travel experts are on hand seven days a week to help plan your next cottage break and answer any queries you may have. Stay up to date with our amazing offers and promotions by signing up to our newsletter. Book with confidence: Over our 25 year history, we've really got to know our customers. Our website features a wealth of information about the destinations we cover, as well as helpful descriptions and photographs of all our cottages. We publish genuine reviews from previous customers too, so you know just what to expect from your holiday cottage before you arrive. Plenty of choice: With more self-catering holiday cottages added to our website each day, the toughest part of planning a cottage holiday is deciding where to stay! From three-night short breaks to weekly or fortnightly trips, we offer flexible breaks to suit any criteria, and with over 12,000 self-catering cottages to choose from, you're bound to find the perfect holiday home for you. For the finest cottage holidays in the best locations, you can count on Sykes Cottages. From classic cottages in the country, luxury holiday homes near the coast and everything in between, our exclusive selection of handpicked holiday cottages provide the perfect base for any type of holiday. We're proud of every one of our self-catering cottages, and are confident that we can find the ideal holiday home for you!